Flag designs hit basketball silos ahead of the Olympics. 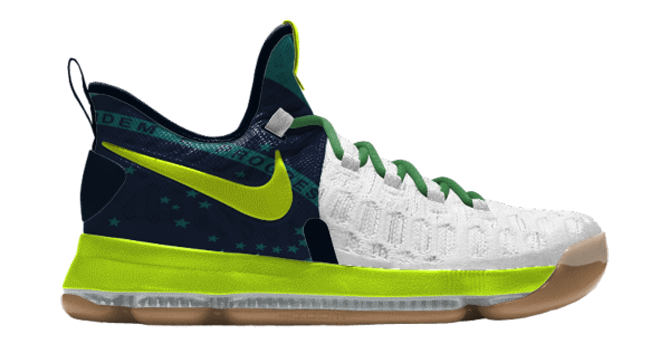 NIKEiD is taking patriotic sneakers to a new level for Rio 2016 by letting at-home designers add the flags of select countries to its sneakers. For some of the shoes the additions simply come in the form of flag icons, but those for Nike's marquee basketball models are more involved. The LeBron Soldier 10 brings your flag of choice onto the upper's straps, while the KD 9 plants it on the back half of the shoe. Note that while Nike's got a decent number of countries represented across the board for its custom Olympic shoes, the number shrinks down to four for these two. Readers can find these new NIKEiD additions here and here.